The towel never quite reaches the bottom of those freshly washed bottles and cups, but let's face it, nothing works as well as air drying. 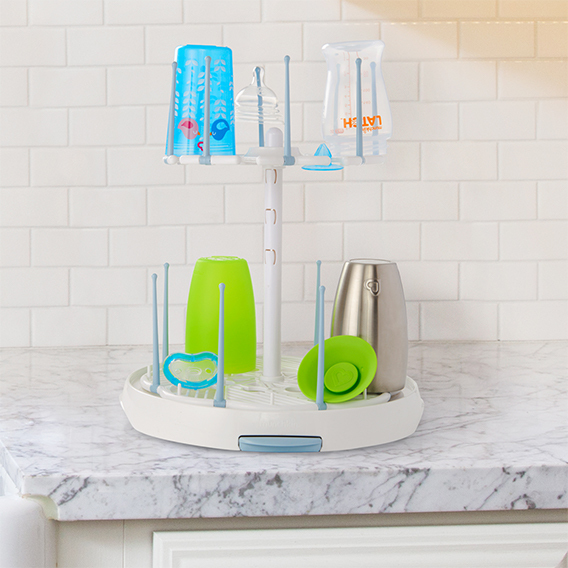 The Munchkin High Capacity Drying Rack has two tiers and plenty of space for loading up to 16 bottles at once, allowing you to leave that towel behind - for good. The convenient two-tier design allows you to double your drying capacity while keeping counters neat and clutter-free. Spin the 360-degree trays for easy loading and unloading of even the smallest bottle parts. Movable pegs even fold down flat for easy storage and can be placed wherever you like on the trays for custom spacing that works best for you. Take this drying rack for a spin, it's a bottle washing must!